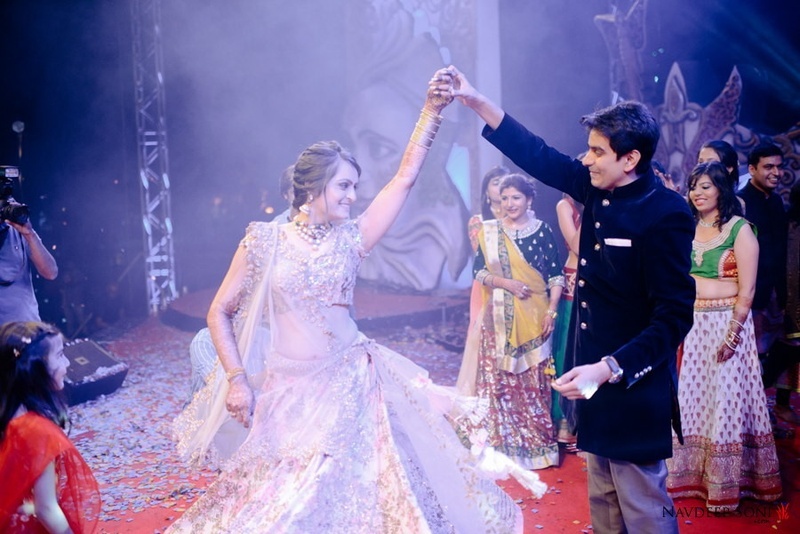 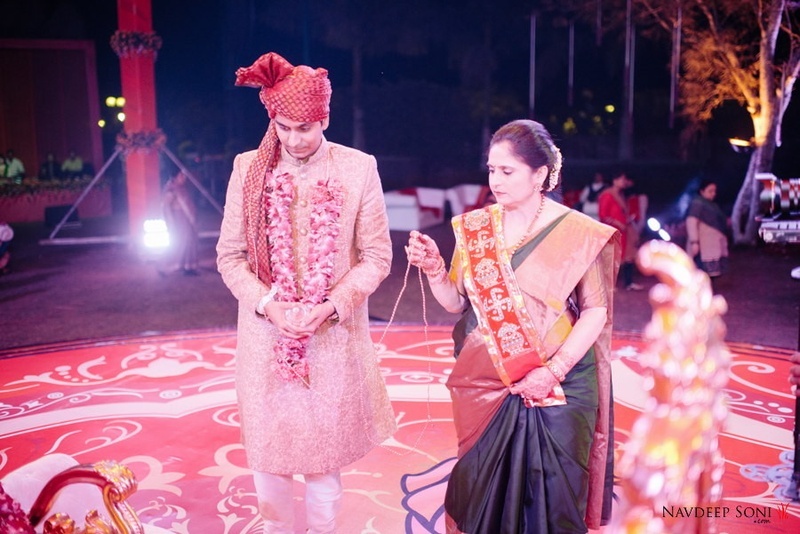 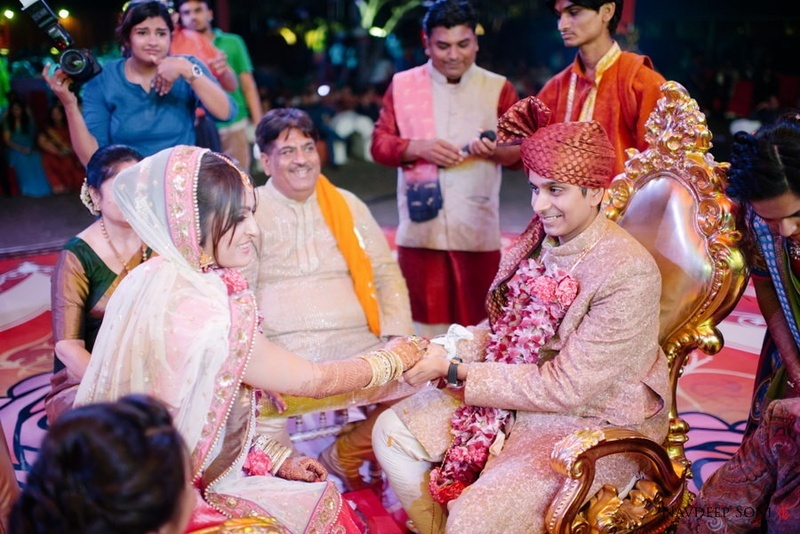 Nidhi and Kishan’s wedding ceremony truly redefines the word grand! 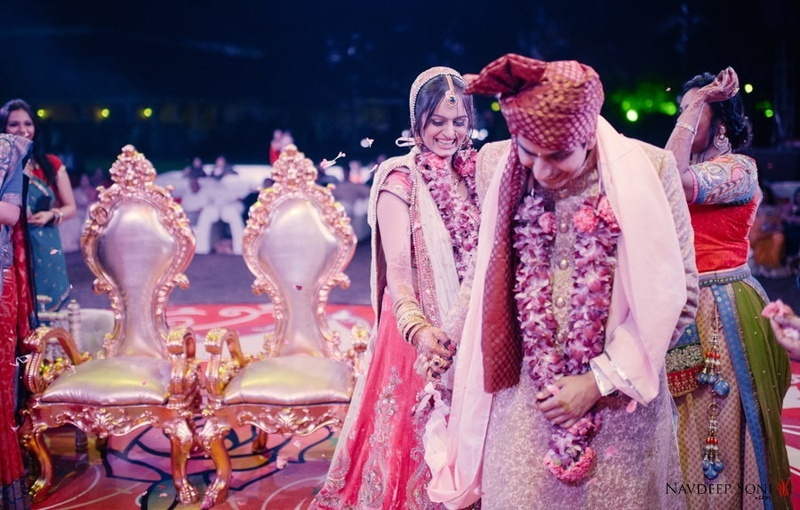 A wedding full of luxury and royalty mixed with tradition spelled out into various vibrant rituals. 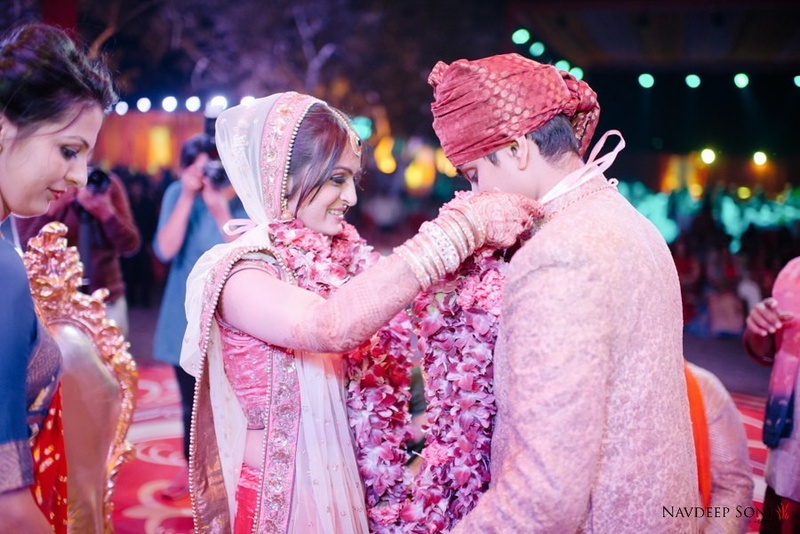 This union of two beautiful souls unfolded in four magnificent ceremonies, each with its distinct décor, theme and colors. 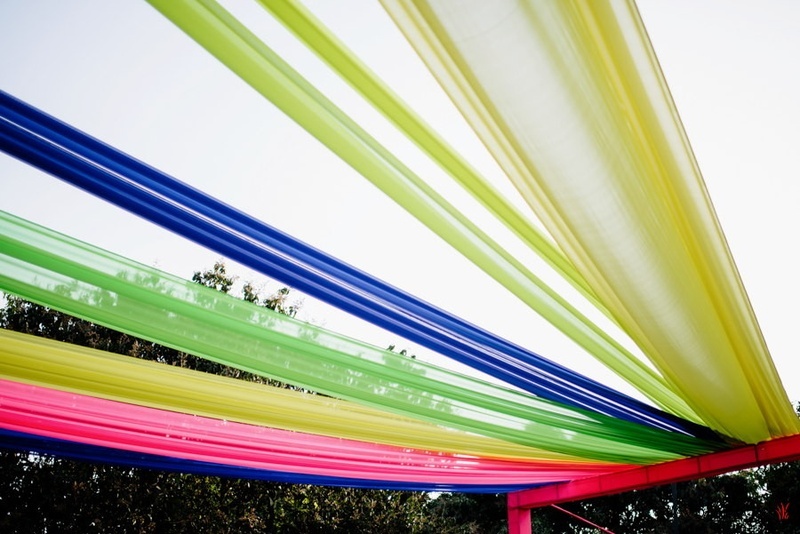 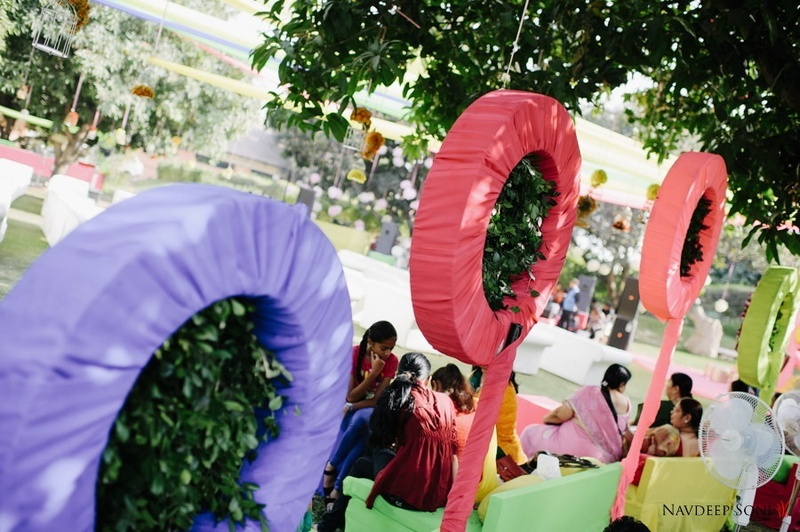 Tyres wrapped in colorful drapes, filled in with vibrant flowers were the perfect backdrop to get Nidhi and Kishan’s celebrations kick-started. 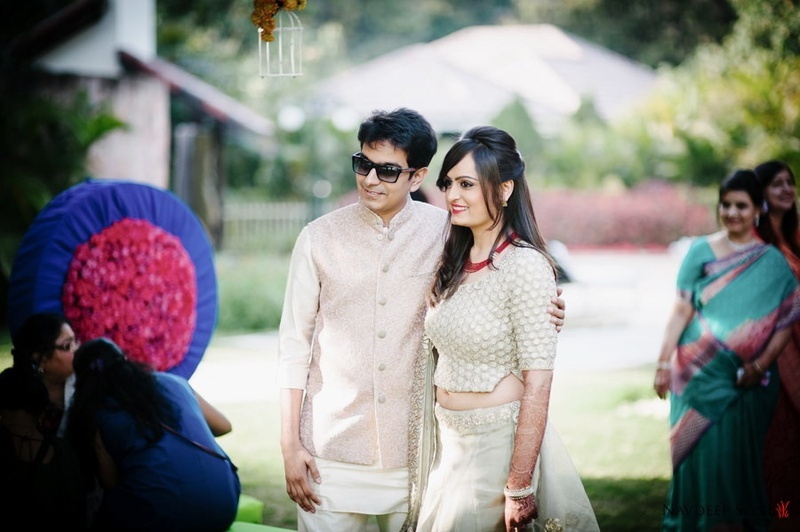 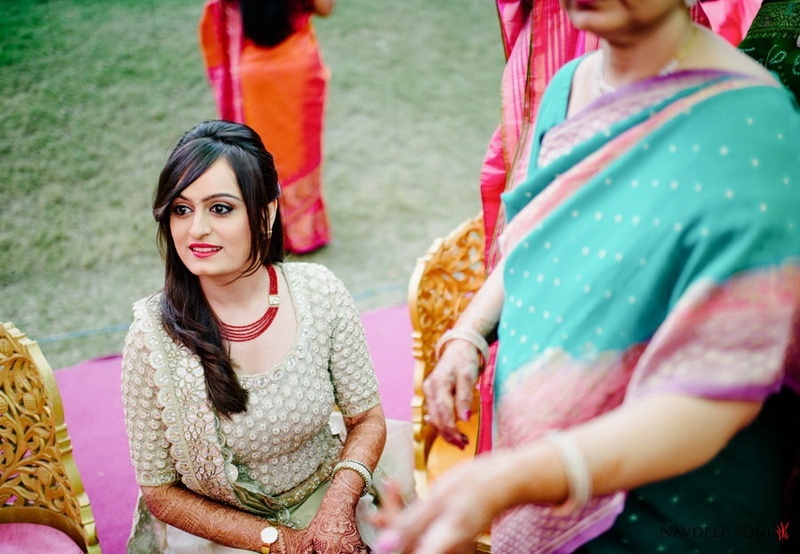 Nidhi wore a pastel green lehenga-choli beautifully embellished with white beads and crystals. 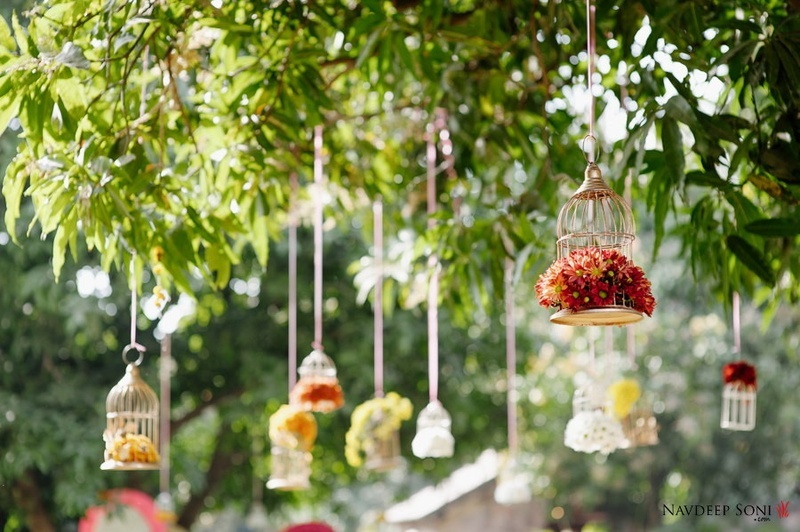 The radiant drapes and elegant bird-cages added just the right amount of class to this bright morning ceremony. 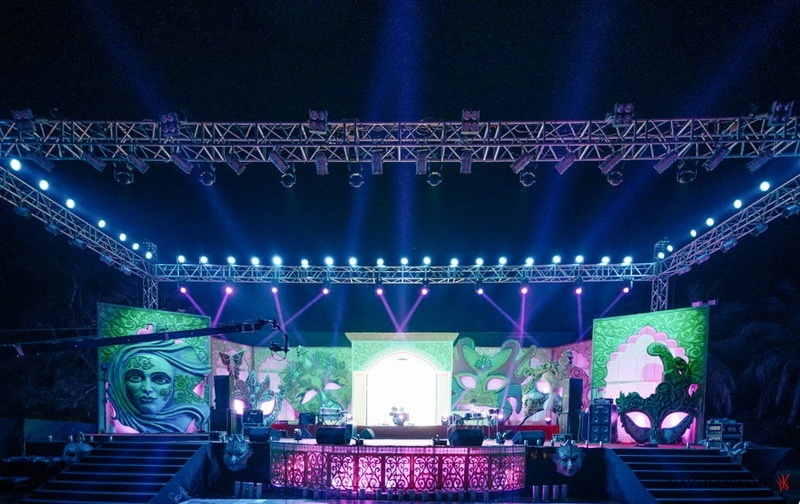 Celebrations then continued on to the magnificent sangeet ceremony, which looked nothing less than a grand Bollywood award function. 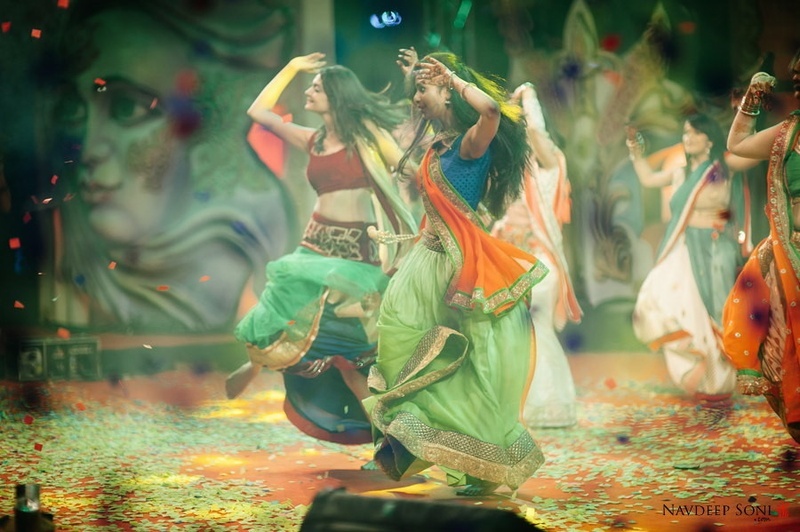 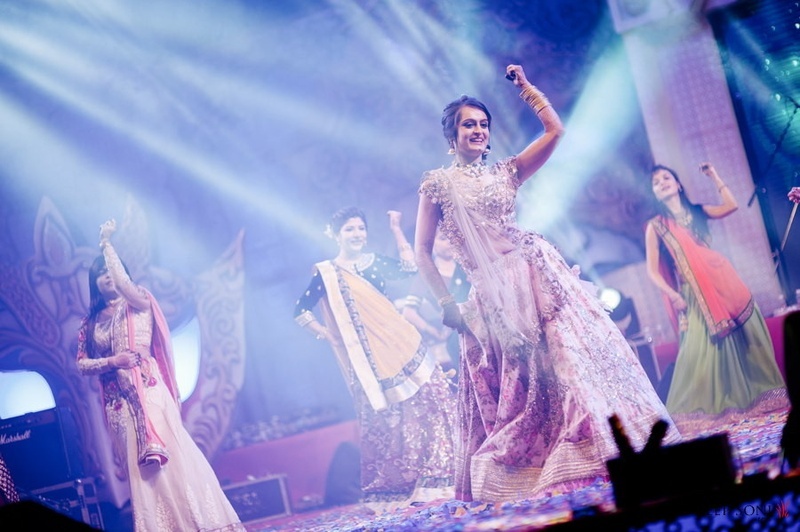 A large stage hosted electrifying dance acts followed by an amazing performance by celebrity singer Neeti Mohan. 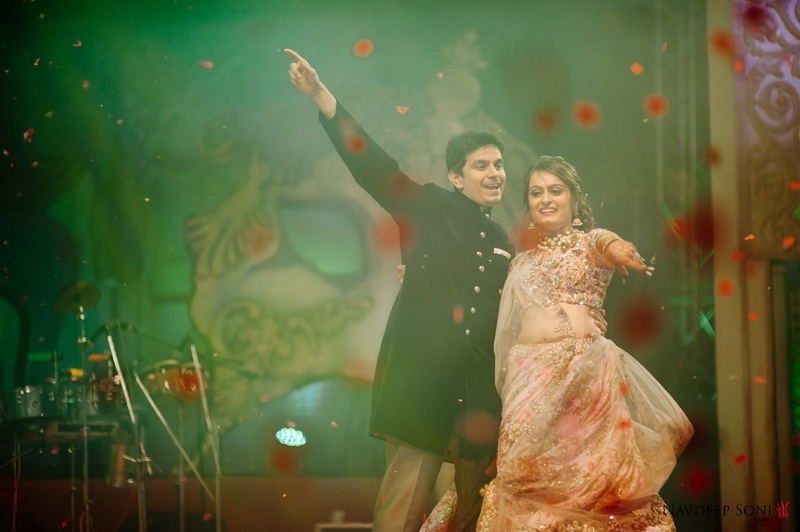 Nidhi and Kishan swayed and danced in celebration of this new phase of life they were stepping into and our hearts swayed right with them. 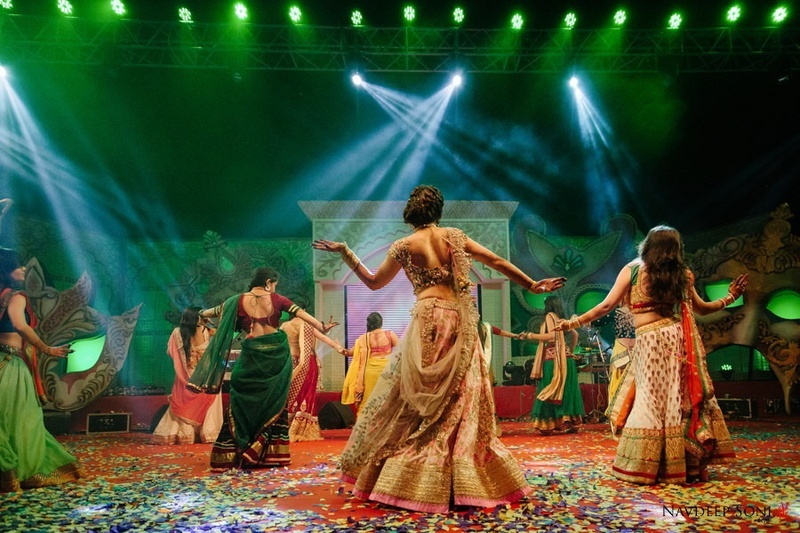 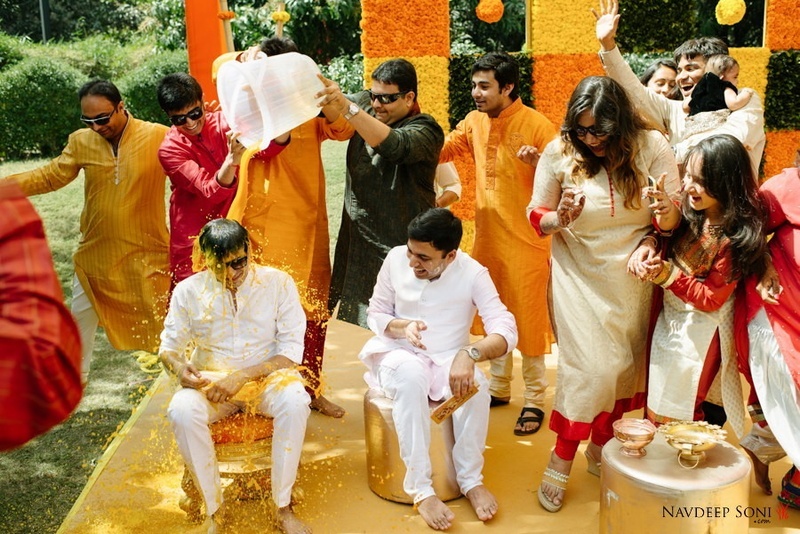 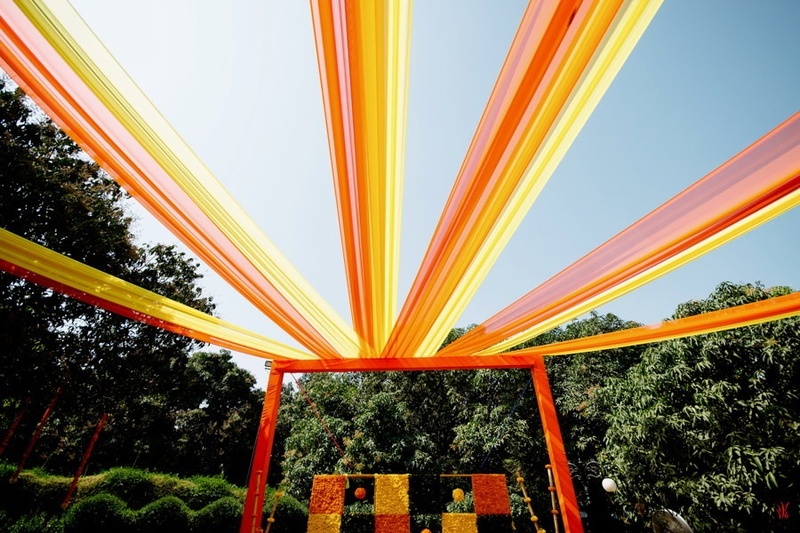 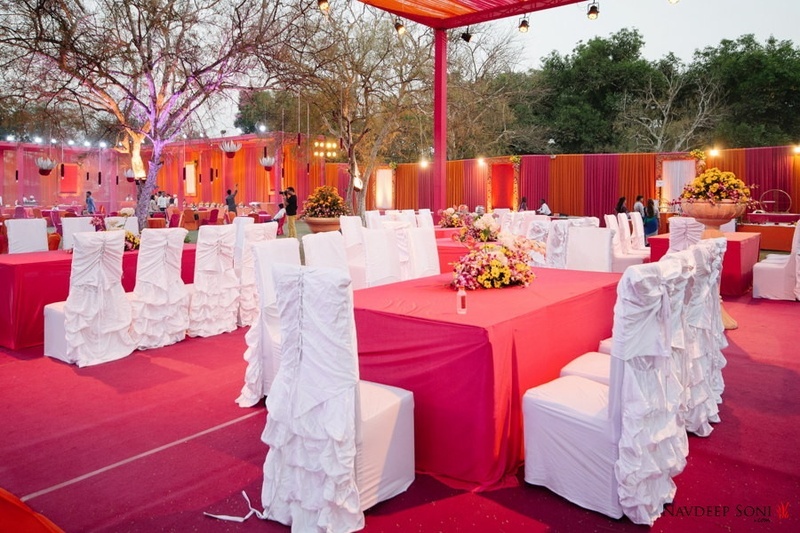 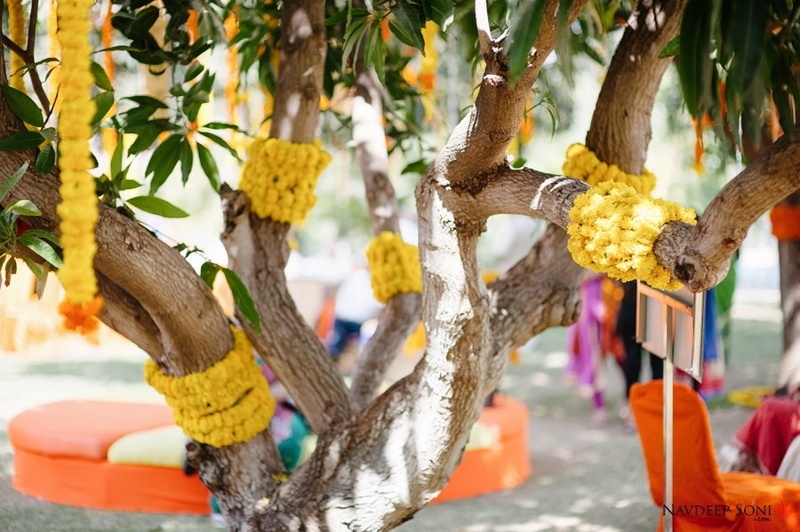 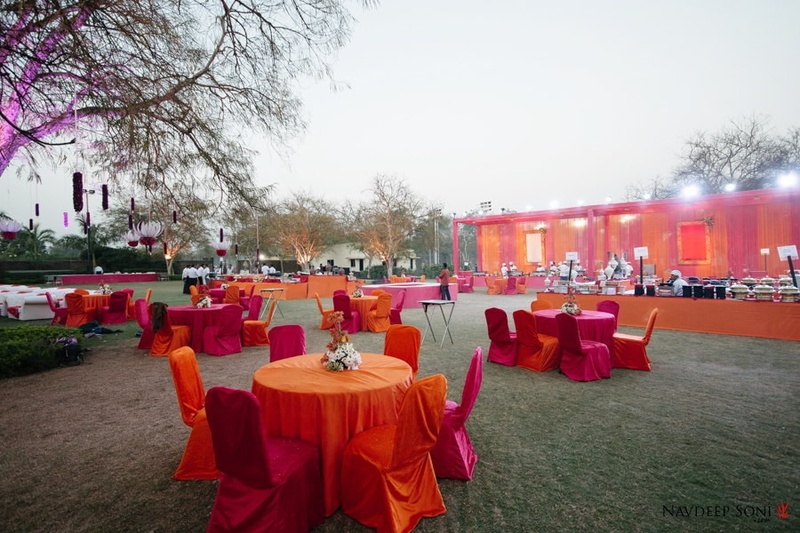 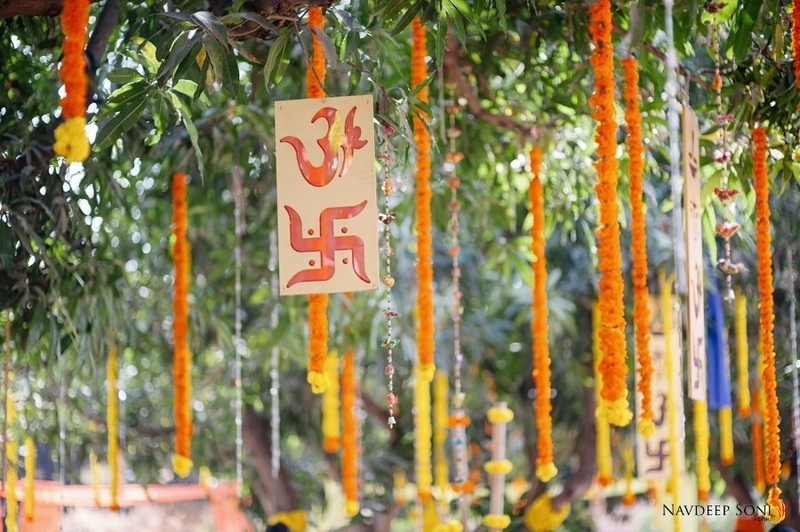 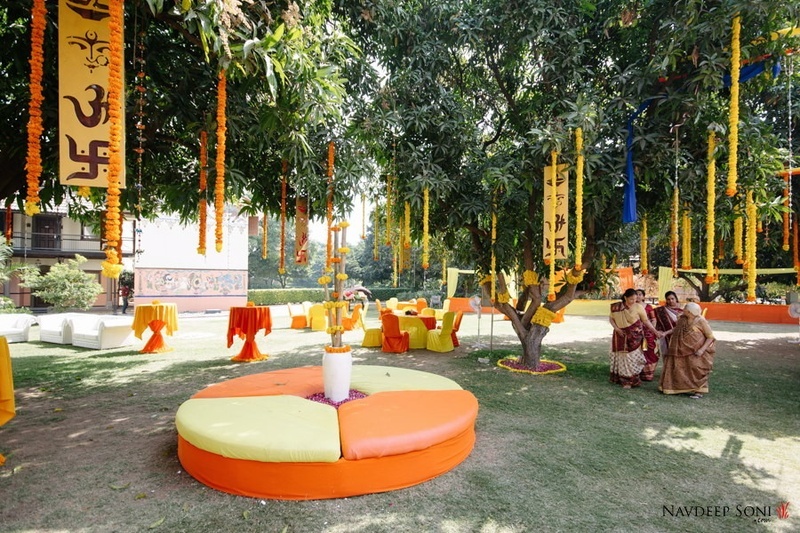 A yellow and orange hued mehendi ceremony with every décor element matched to the theme all because of the expertise of 7X Ahmedabad – who took the décor at this mehendi function to a whole new high. 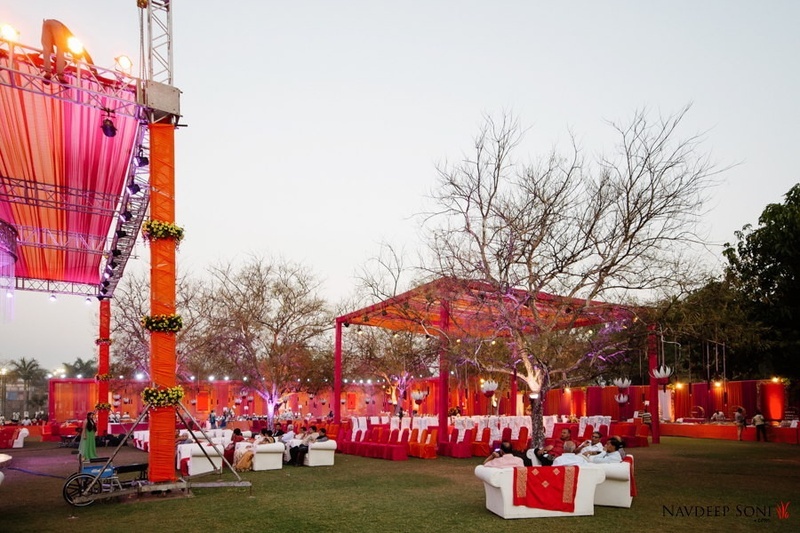 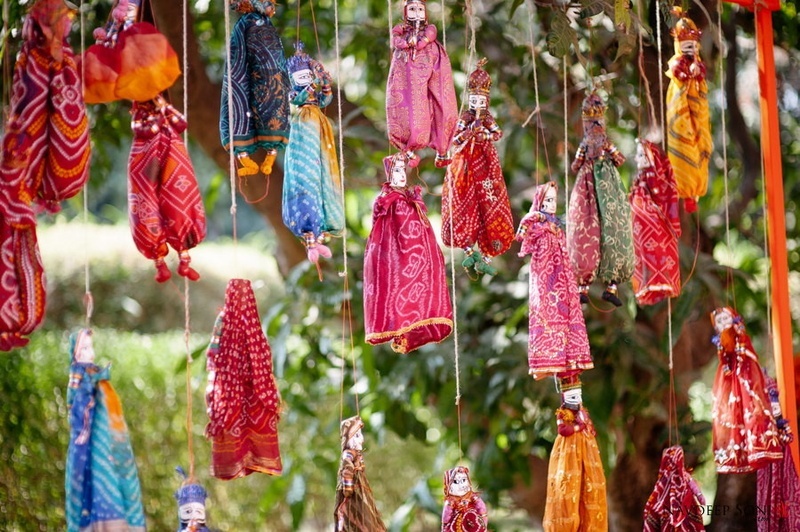 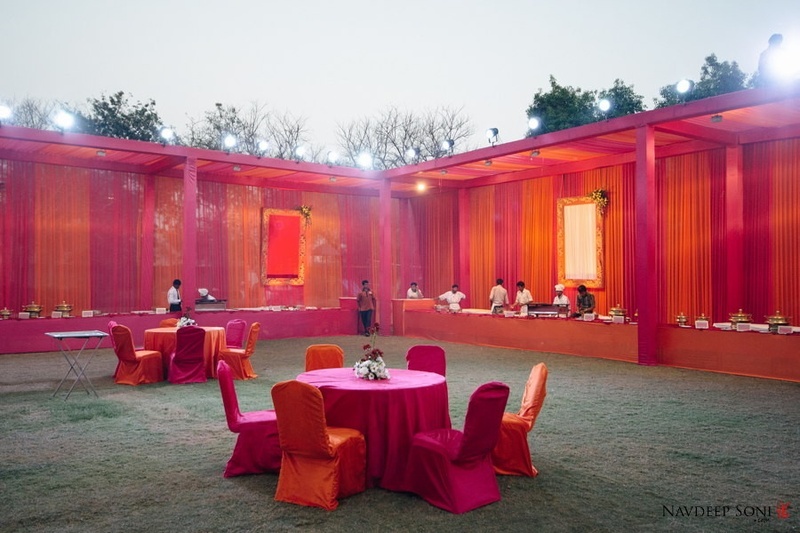 The strings of marigold, the seating arrangement, the colorful Rajasthani Kathputli’s all dressed in bandhani – every element was so well planned and executed. 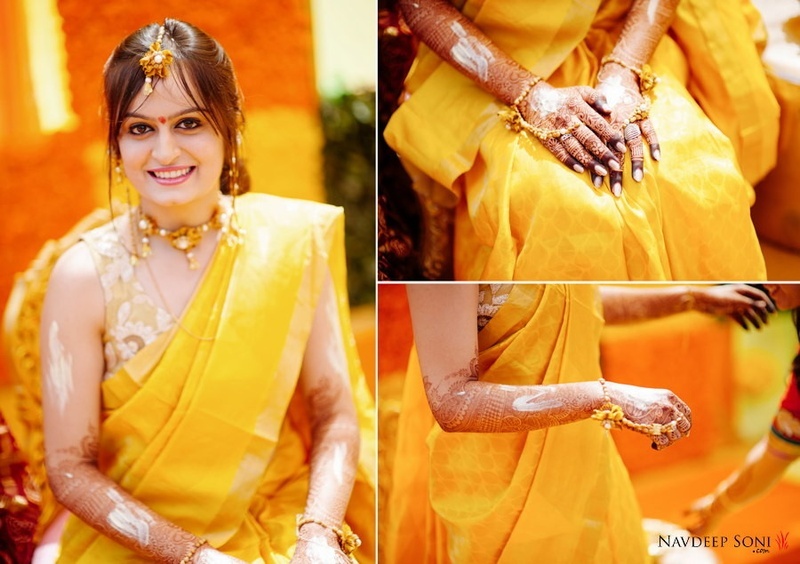 Nidhi, the woman of the hour, looked stunning in her bright yellow cotton saree. 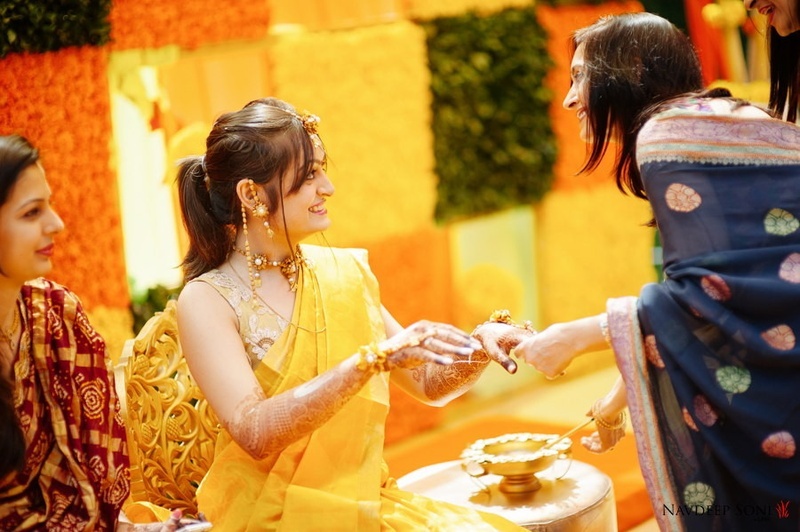 She accessorized her look with ethnic gold jewellery studded with white pearls. 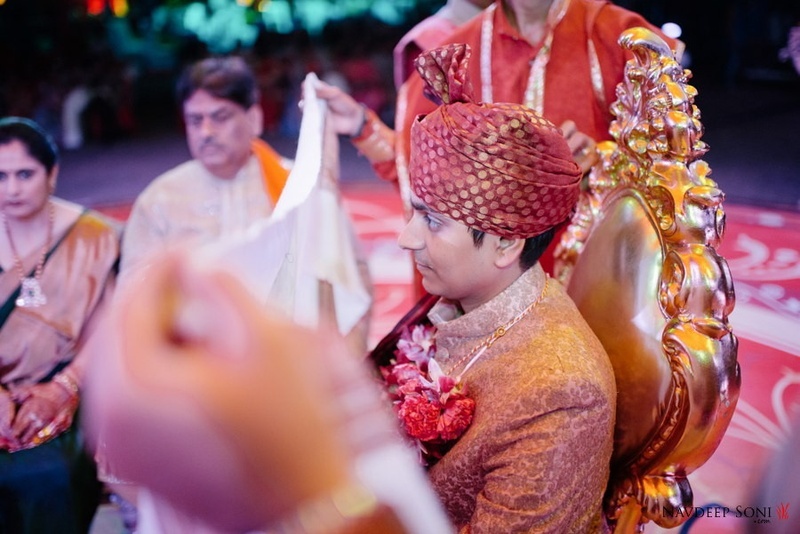 The level of grandiosity reached new heights with each passing wedding ceremony, and it was now time for the grandest even of ‘em all – The Magnificent Wedding Ceremony! 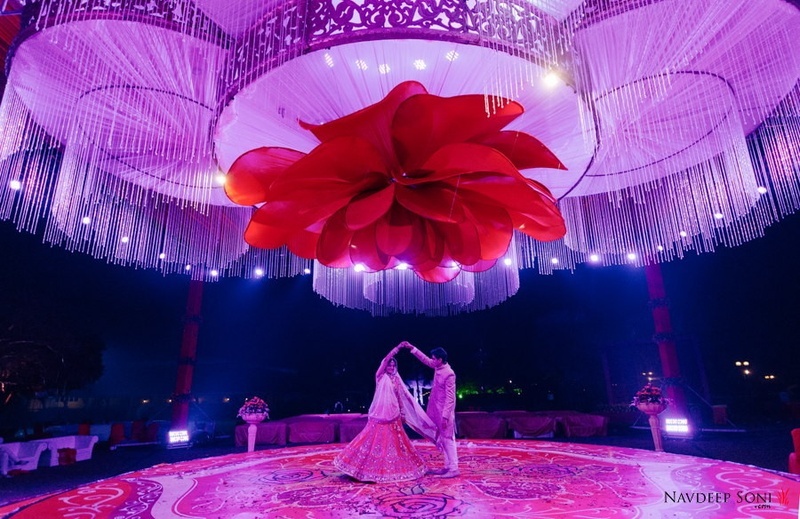 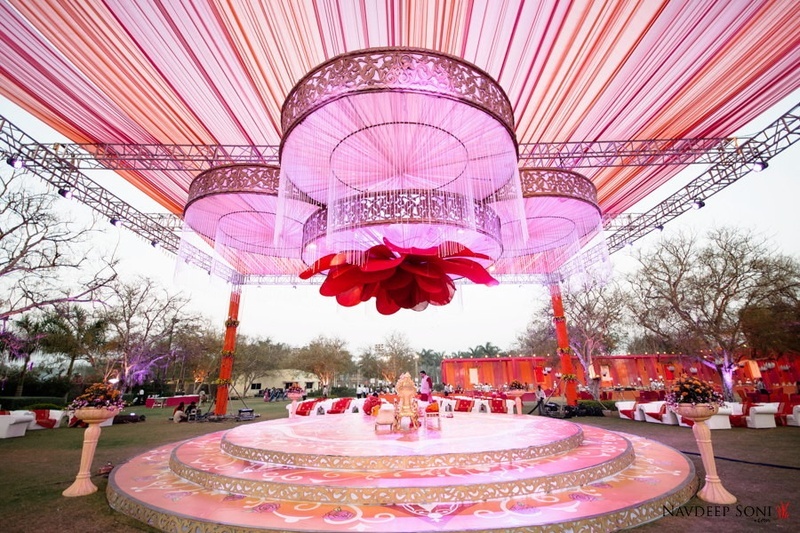 A larger-than-life wedding mandap with circular glass chandeliers hosted the Saat Pheras of this beautiful couple. 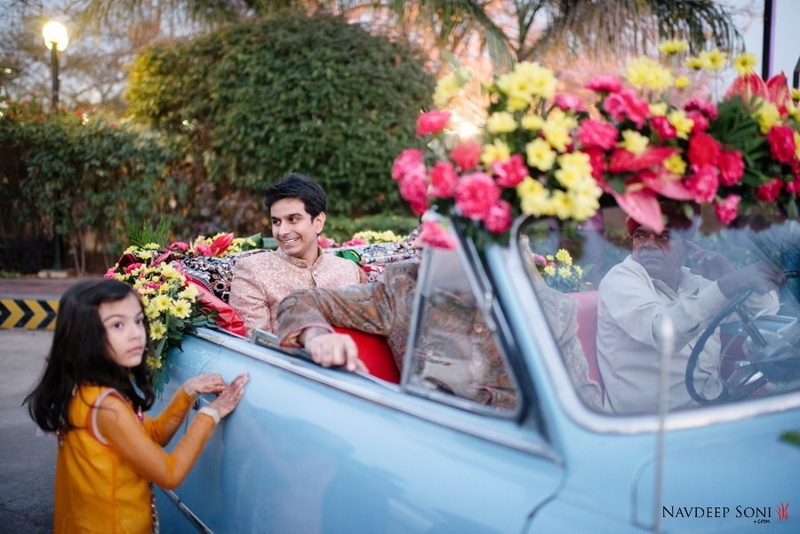 The handsome groom, dressed in a classy Sabyasachi sherwani arrived in a sky blue Plymouth and looked no less than royalty. 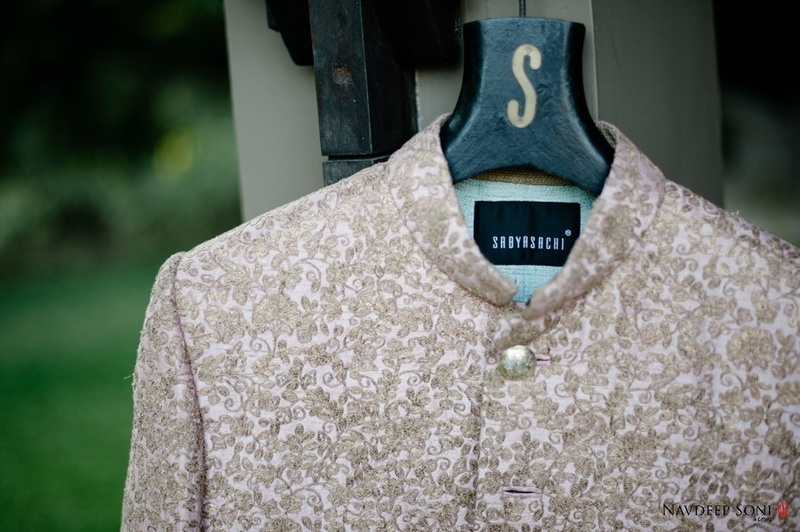 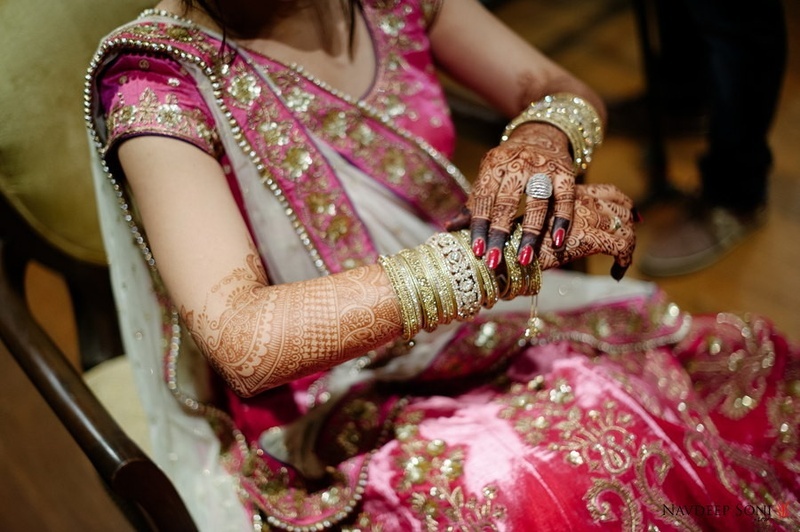 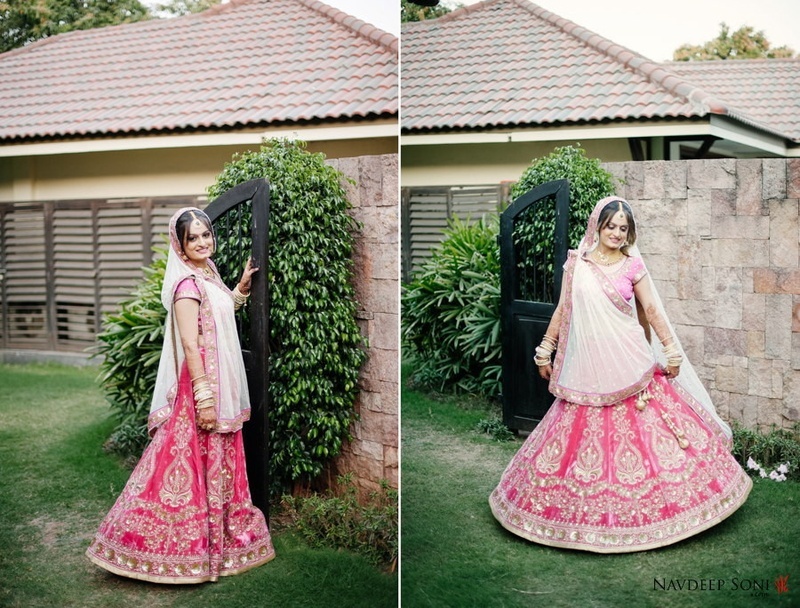 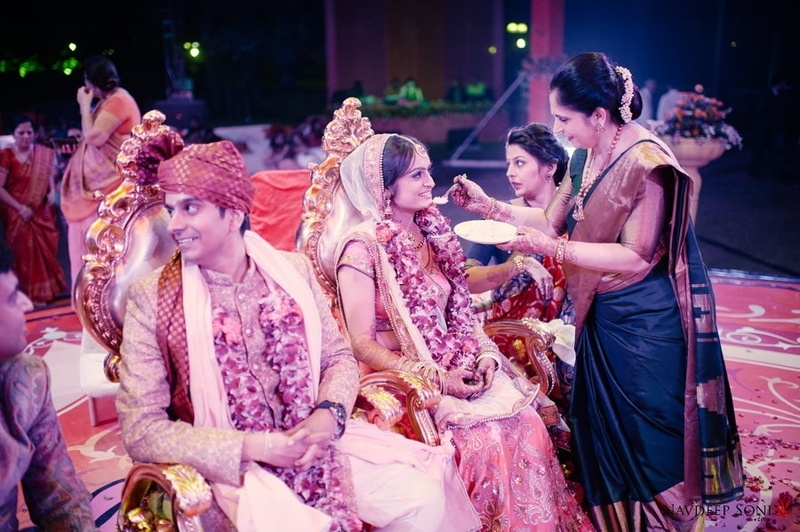 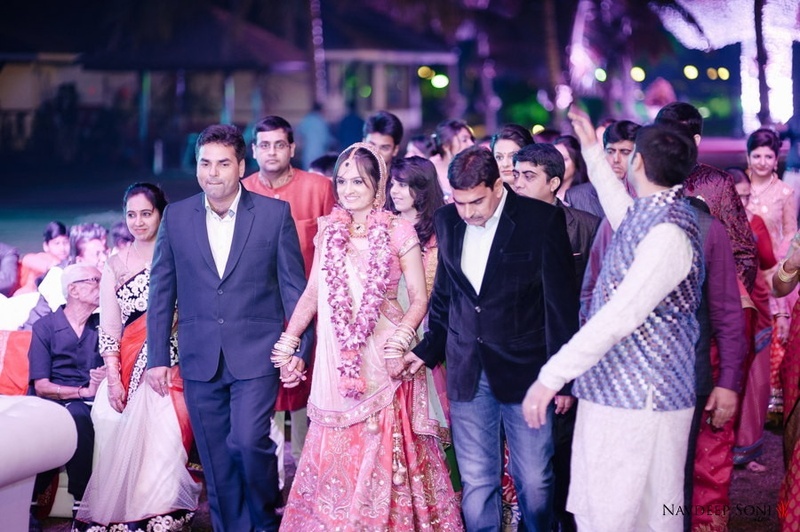 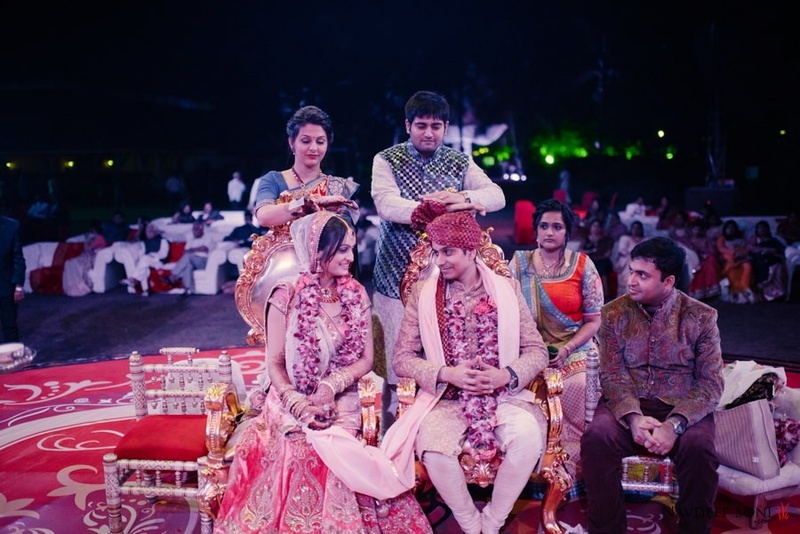 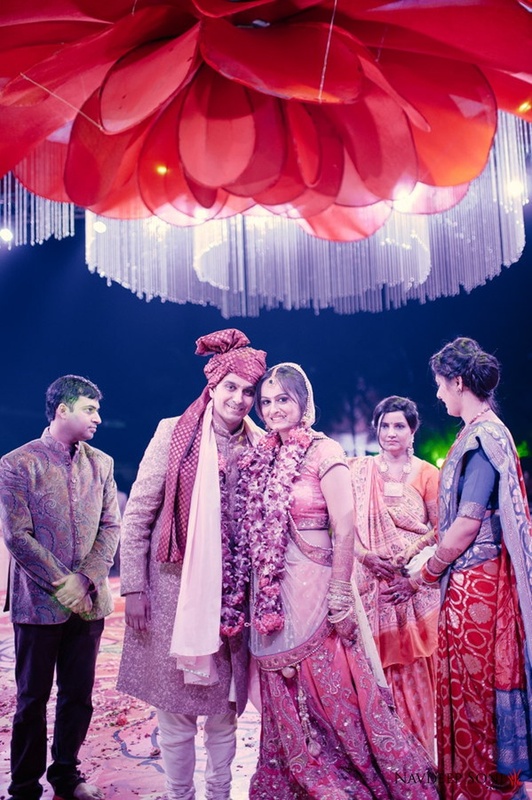 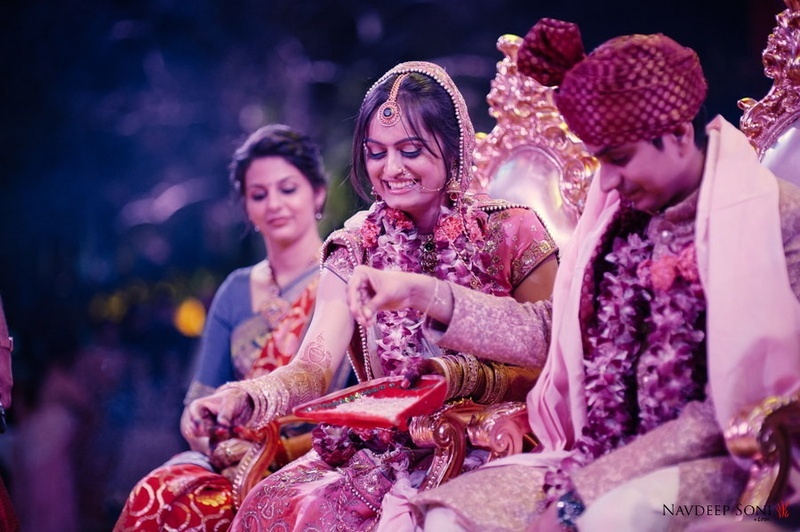 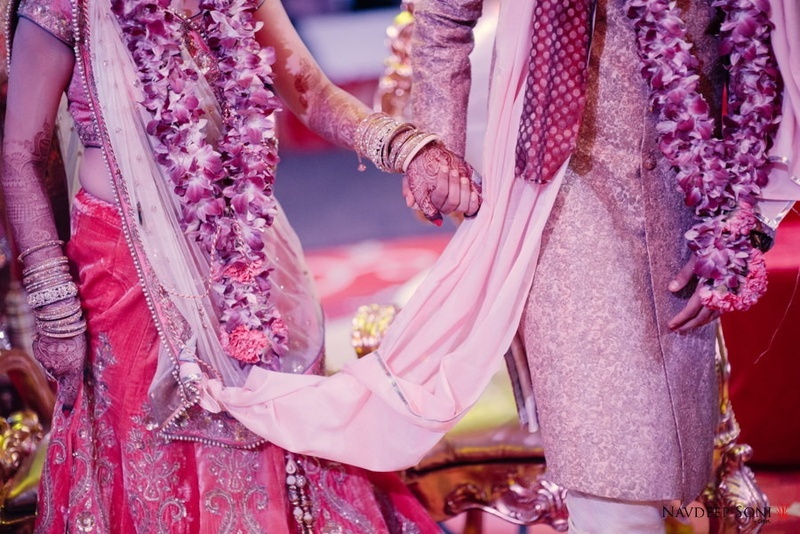 Nidhi, his bride wore a gorgeous pink kalidar lehenga with minimal jewellery and looked drop-dead-gorgeous! 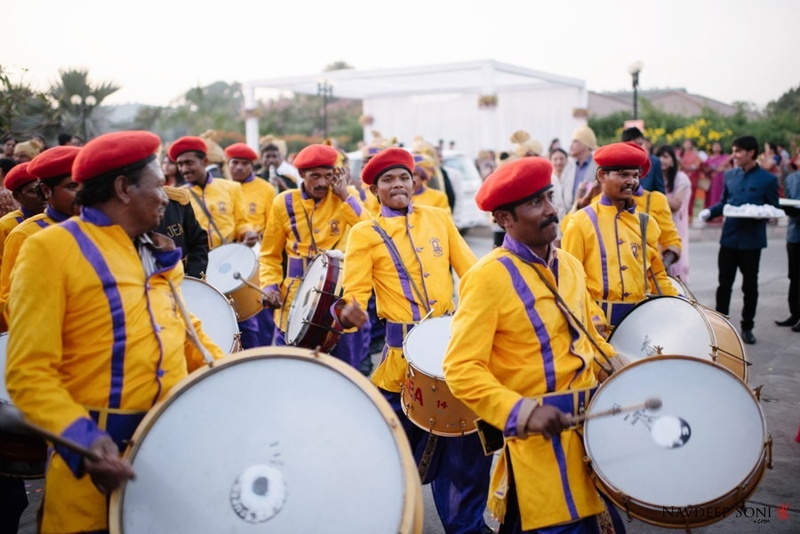 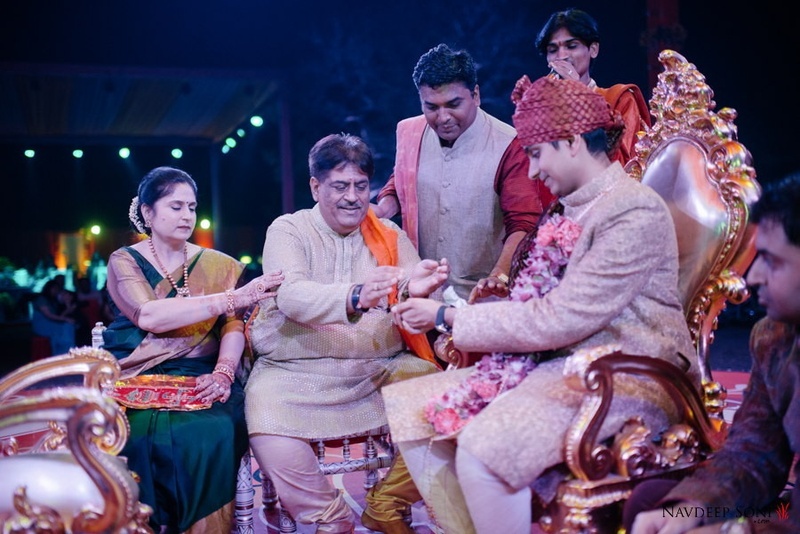 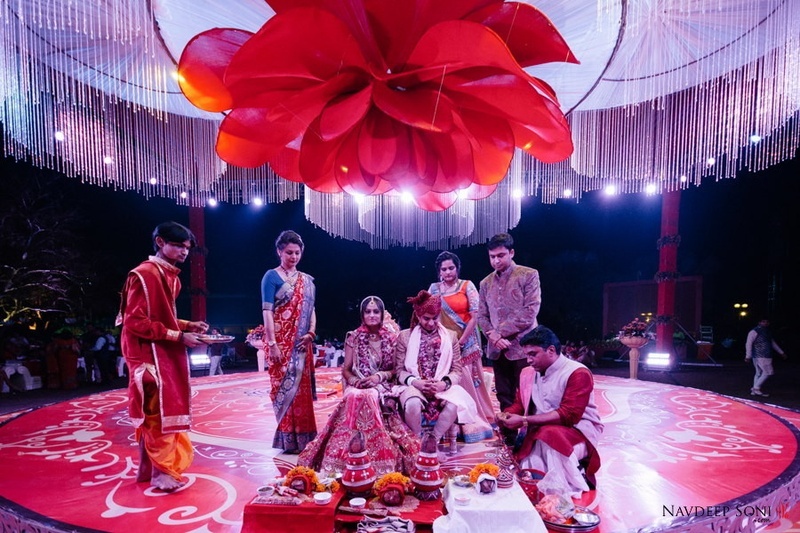 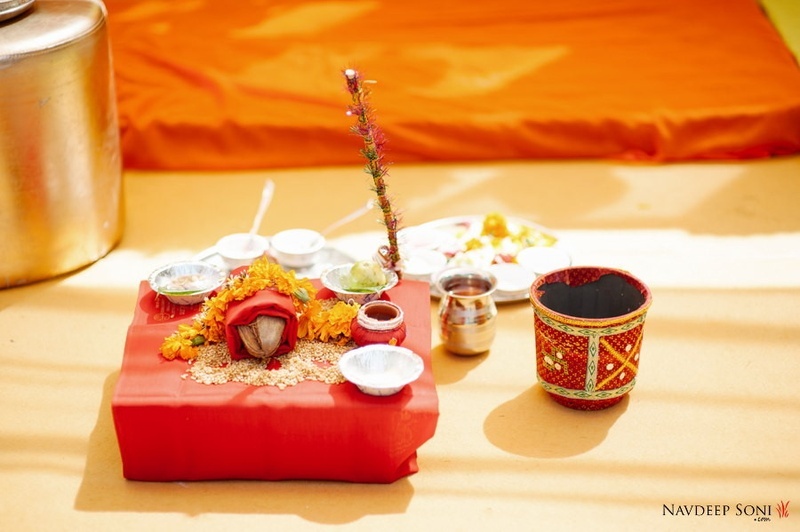 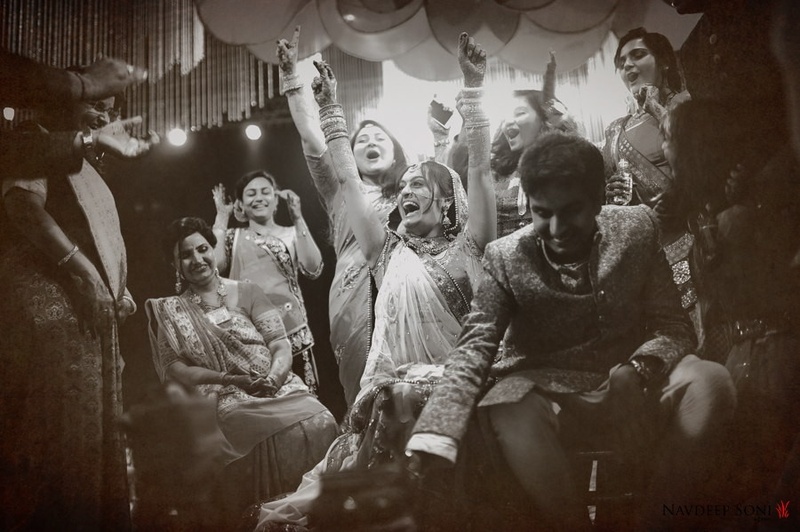 Even with all the grandeur and elegance, this wedding party did not fail to complete the happy little wedding rituals that make it all worthwhile – like the naak khichai, the joota chupai and playful ring-finding ceremony. 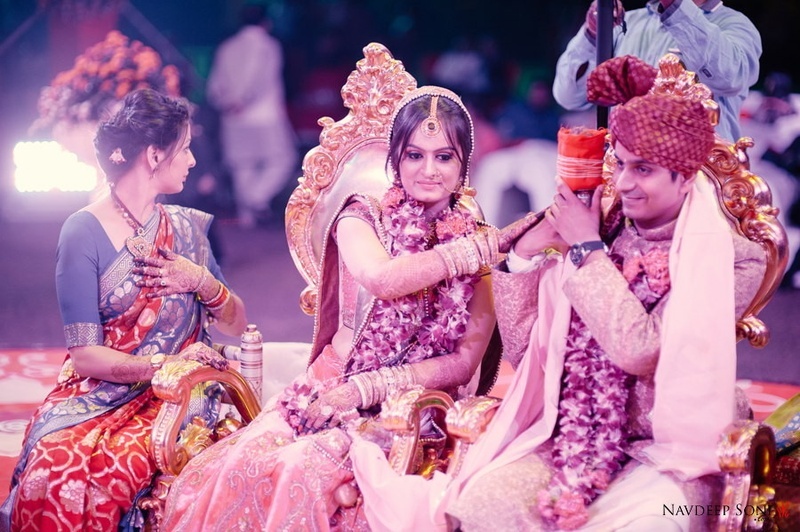 Navdeep Soni takes us through a journey with every picture taken at this tremdously beautiful wedding ceremony. 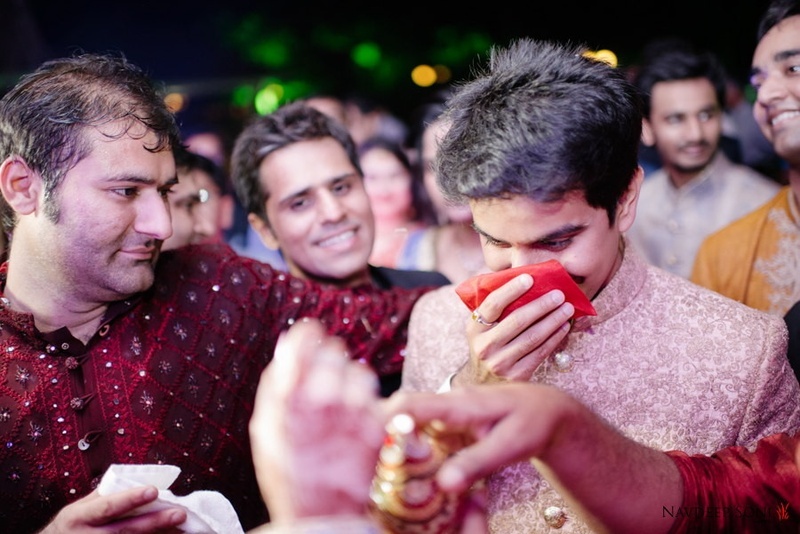 Every photograph taken does not fail to capture the true essence of emotions felt in realty. 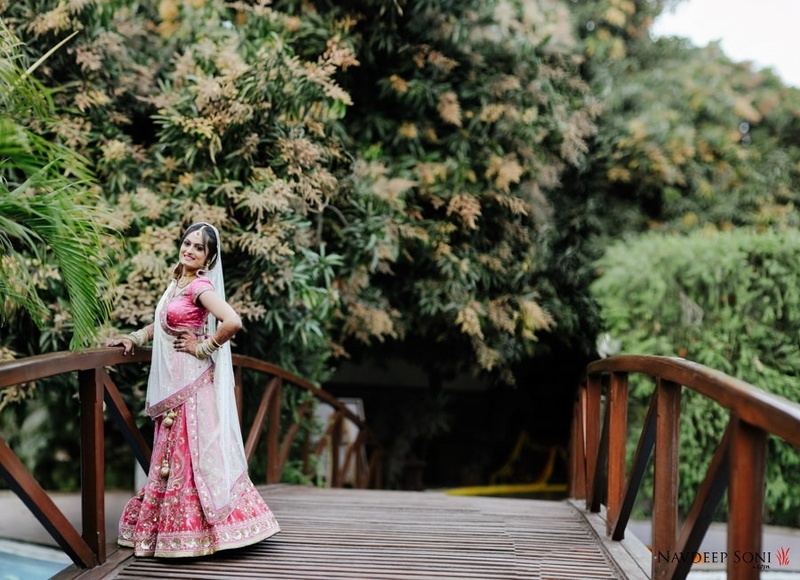 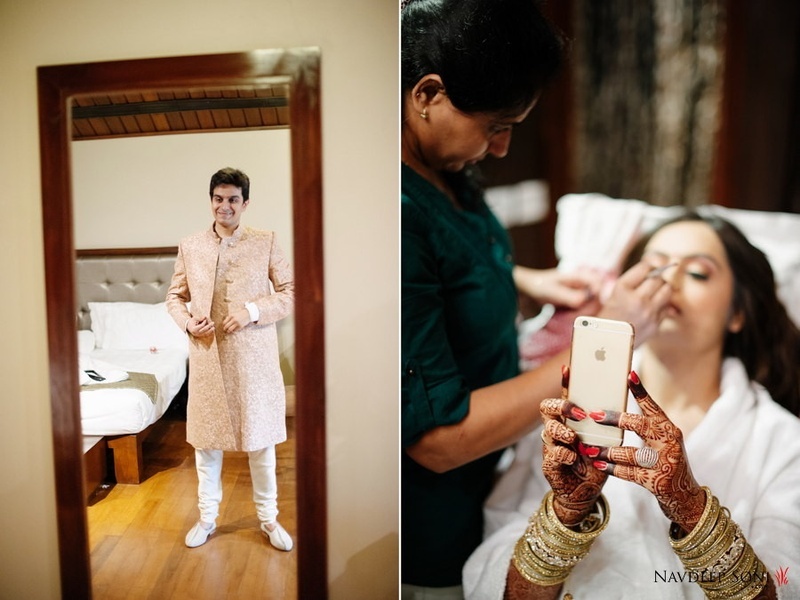 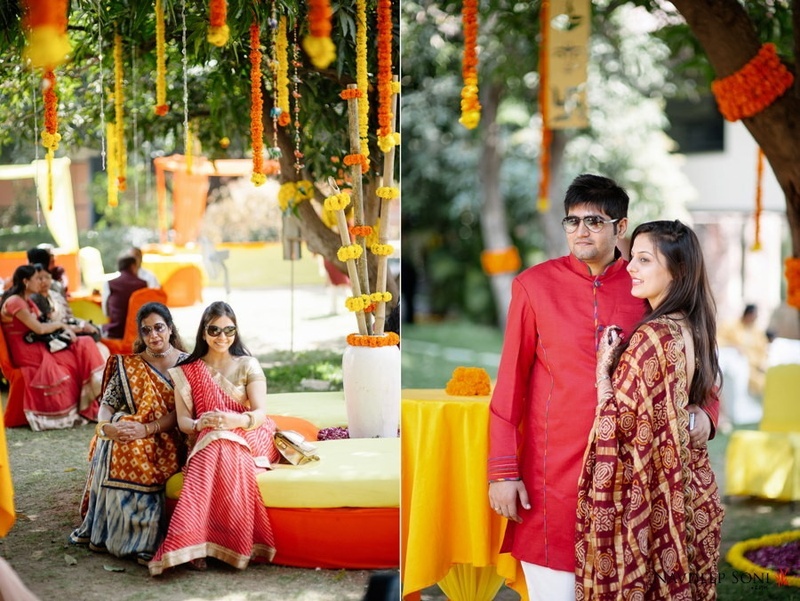 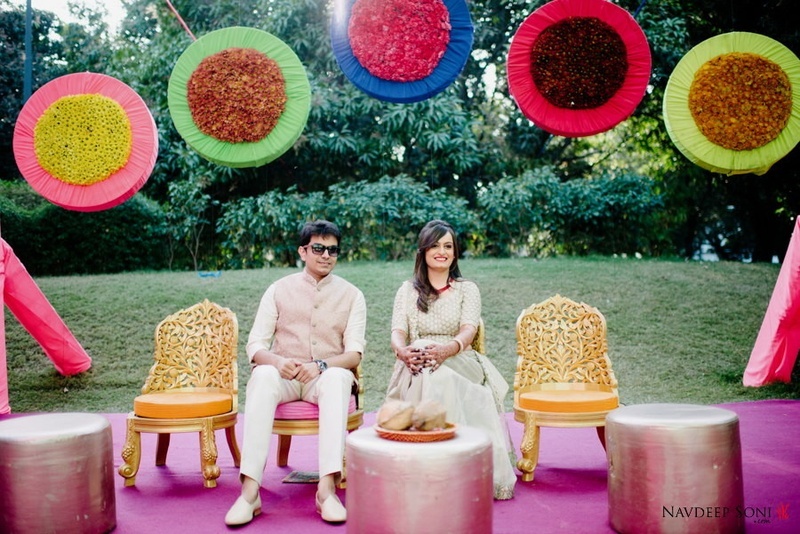 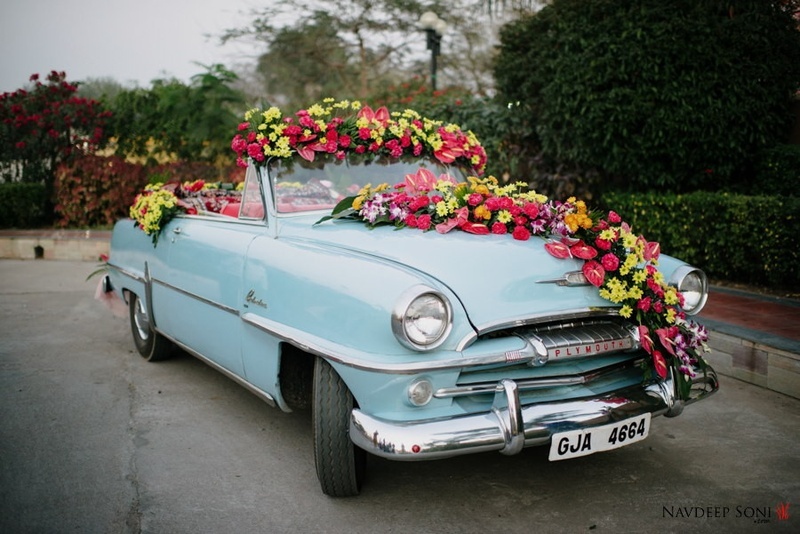 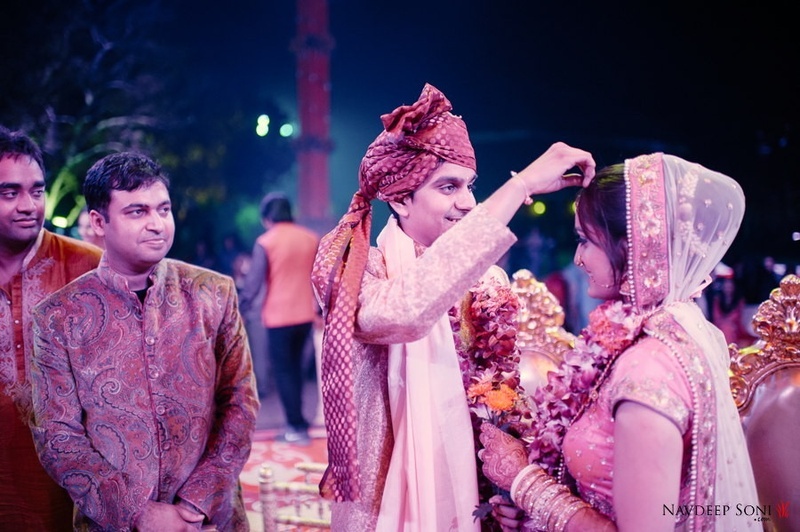 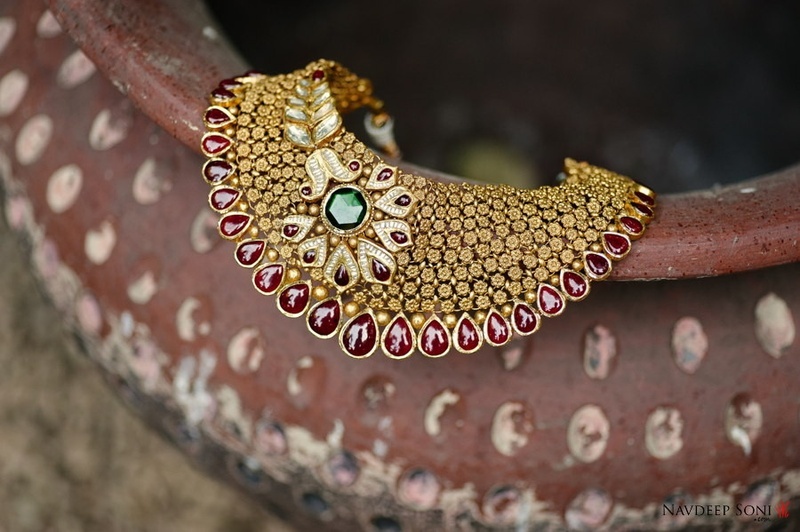 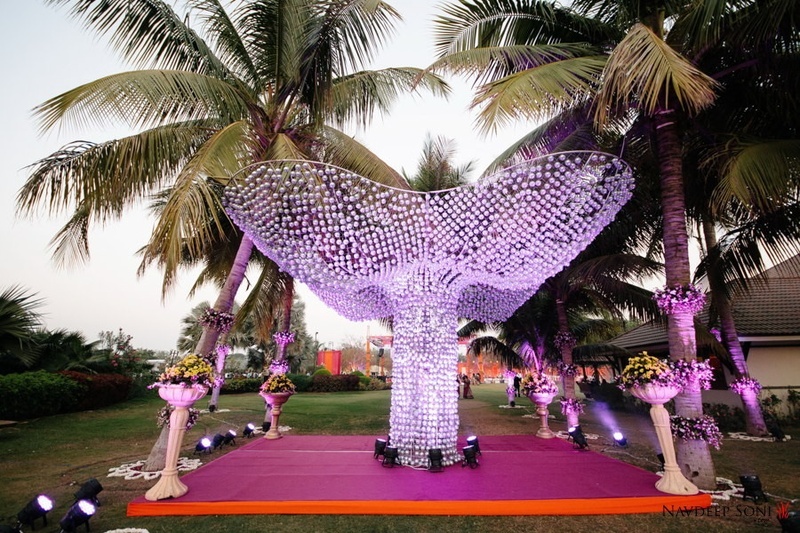 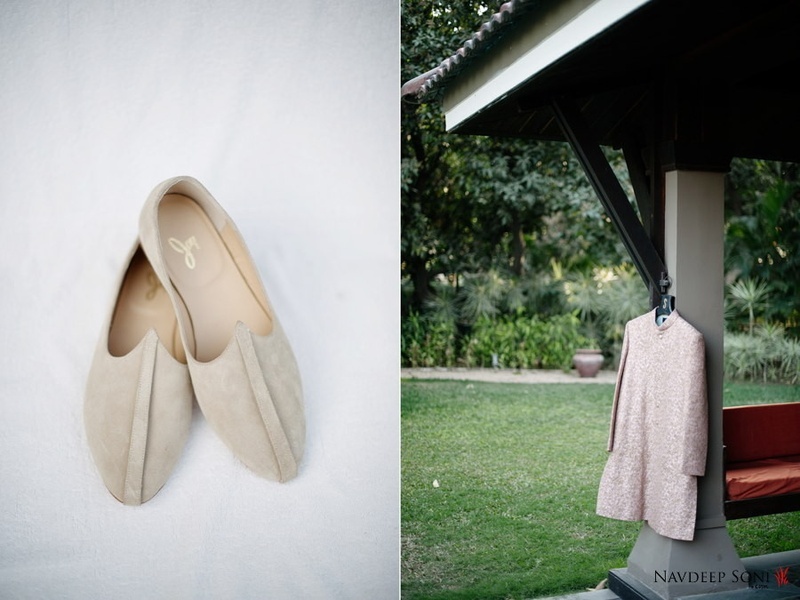 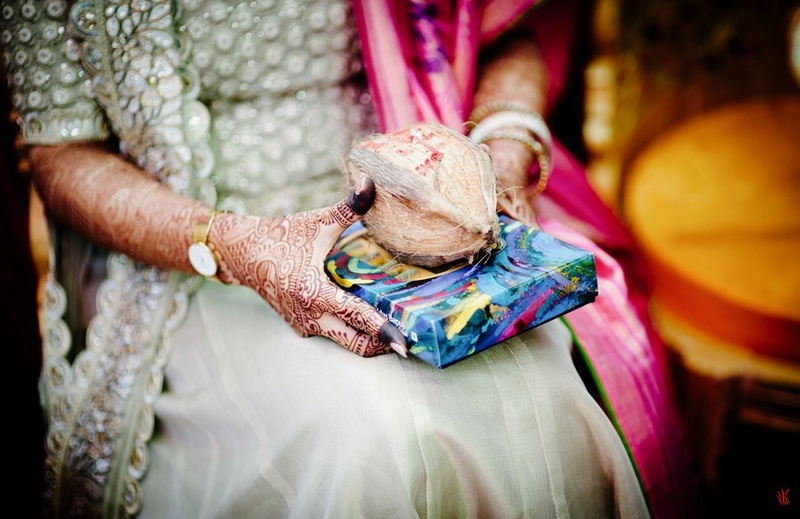 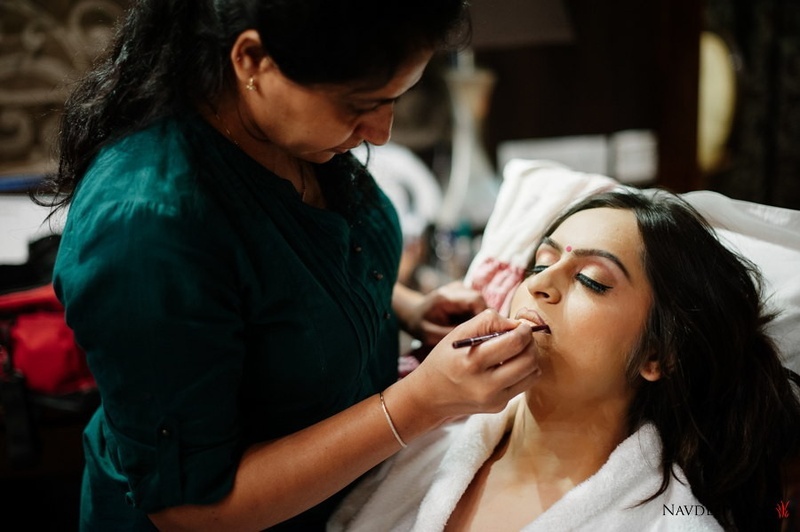 Take a look at a few images taken from Nidhi and Kishan’s tasteful wedding celebrations. 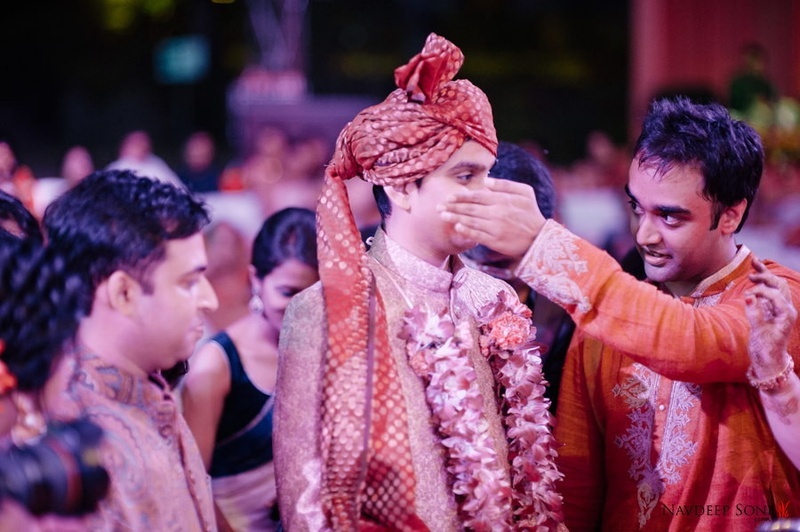 Helping his man of the hour!